emptiness | One New Brain Please ? I Couldn’t take the depression any longer! 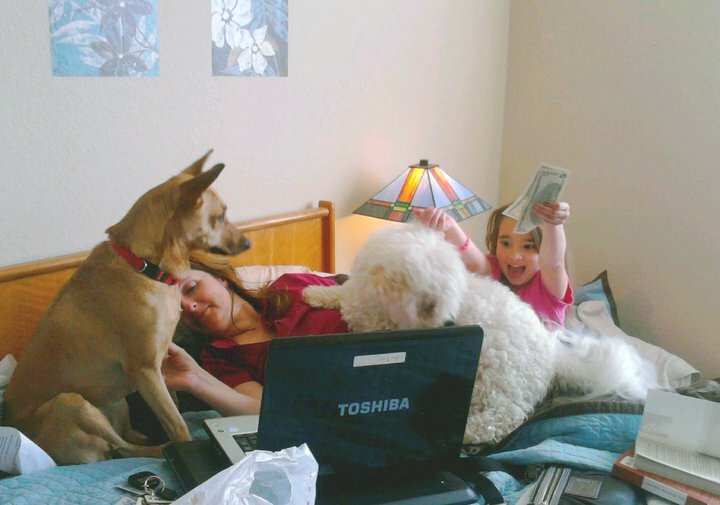 Here’s a picture( I’m between the dogs ) of my typical day of depression. I looked up side effects of topamax-depression/lethargy. I told my husband I’m not taking it/asked him to “watch” me. My docs have me so afraid of my hypomania. I was hypomanic for years/it caused no problems. Okay, as long as I’m married. It keeps me grounded. My husband actually fell in love with my hypomanic side-he thought I was charming. To get back to the point, after 24hrs, he/I could tell a difference in my attitude. Now, I’m out of bed. I’m actually doing “normal” things. It’s now been a week/I still feel good. A little anxious. But, I’ll take that over depression any day. I can listen to m y deep breathing cd etc.. And help the anxiety. Since my husband got laid off, I have liked having him home. It’s been like when we first married and he worked from home. We never got sick of each other. Then boom. The company he worked for for 10 years, who always claimed they rewarded longevity and loyalty, laid him off . Boss called him up out of the blue on a Friday and said don’t come to work on Monday. I had already began falling into a depression, but that pretty much sealed my sentence. So, I know once My husband gets a job and he’s not around I better have a plan to deal with the emptiness or I’ll find myself slipping back into a depression. I’m still in one now. But, each day I’m getting better. And losing that weight that last med they had me on is helping too. Oh, I’ll have to go look for the bottle.I can’t remember the name. I gain 20 or 25 lbs in a month. I puffed up like a blowfish. It was all in my stomach too. I looked 6 months pregnant. I’ve always been thin, so that was tough. Hard enough turning 45, then walking around like I drink a 24 pack ever day!